When it comes to oil cleansing, I’m pretty low-maintenance: Plain carrier oils (like jojoba or coconut) and done. But, I’ve been experimenting with more artisan cleansing oil blends lately, and have been pleasantly surprised at how much I’m liking some of them that 1) contain neither of my favorite plain carrier oils and 2) are loaded with beneficial oils to target my skin concerns. One that’s in heavy rotation lately is Mullein & Sparrow’s Cleansing Oil, a light, slippy oil packed with anti-inflammatory and antibacterial properties. Mullein & Sparrow’s Cleansing Oil helps lift and loosen impurities during the sacred facial massage routine I do every night before bed. That’s thanks to a smart blend that includes castor oil, a staple in oil cleansing, but an ingredient I’ve avoided in my own DIY solutions because of how drying it could be to my skin. See, this is why I don’t DIY. I don’t do proportions well. When castor oil is mixed into a cleansing oil by a holistic skincare master (hi, Anit! ), you reap its benefits and get none of the drying mess that you get in a DIY. In combination with black cumin seed and frankincense, castor seed oil gets down deep during the oil cleansing process and helps bring blackheads to the easy extraction point. This blend is the one to try if your skin is acneic and congested like mine. The anti-inflammatory and antibacterial properties of black cumin seed oil shine in this formula. When paired with frankincense, another anti-inflammatory, antiseptic powerhouse, this cleansing oil can easily get to work on problem skin. Naturally astringent hazelnut oil serves as a light carrier that holds its own in the acne takedown alongside black cumin and frankincense, while rose geranium and rose absolute offer calm and beauty to your skin and the overall blend. The result? A truly hardworking, cleansing oil that lifts and loosens while gently softening the skin. 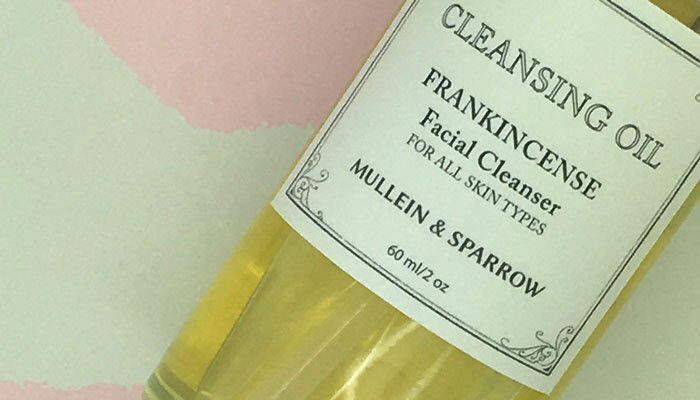 Mullein & Sparrow’s Cleansing Oil is easily one I’d repurchase and recommend, especially if you have acne-prone skin. It’s gentle, deep-cleansing and a pleasure to use every single day. Do you oil cleanse? What do you use? What are your favorite carrier oils, and what are your favorite blends? Tell me in the comments section!